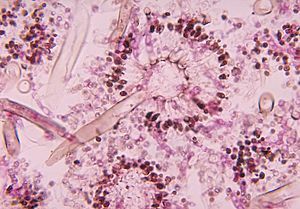 So far on this site I’ve tried to address microbiology topics from all areas of the field; from the standards in bacteriology and virology to some more exotic parasites and fungal infections. When you look at the range of infections that people can acquire you see many bacteria, viruses, and parasites. However, invasive fungal infections, especially those that occur in healthy immune-competent hosts, are exceedingly rare when you compare mammals to insects, plans, and amphibians. I never gave this much thought until coming across a group of papers that together indicate that something as fundamental as a warm body temperature could protect us from a variety of pathogenic fungi.